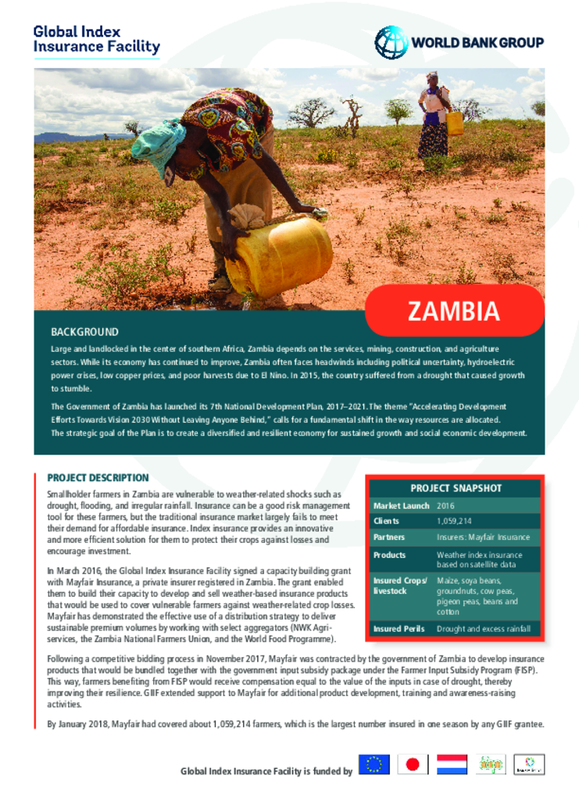 Smallholder farmers in Zambia are vulnerable to weather-related shocks such as drought, flooding, and irregular rainfall. Insurance can be a good risk management tool for these farmers, but the traditional insurance market largely fails to meet their demand for affordable insurance. Index insurance provides an innovative and more efficient solution for them to protect their crops against losses and encourage investment. In March 2016, the Global Index Insurance Facility signed a capacity building grant with Mayfair Insurance, a private insurer registered in Zambia. The grant enabled them to build their capacity to develop and sell weather-based insurance products that would be used to cover vulnerable farmers against weather-related crop losses. Mayfair has demonstrated the effective use of a distribution strategy to deliver sustainable premium volumes by working with select aggregators (NWK Agri-services, the Zambia National Farmers Union, and the World Food Programme). Following a competitive bidding process in November 2017, Mayfair was contracted by the government of Zambia to develop insurance products that would be bundled together with the government input subsidy package under the Farmer Input Subsidy Program (FISP). This way, farmers benefiting from FISP would receive compensation equal to the value of the inputs in case of drought, thereby improving their resilience. GIIF extended support to Mayfair for additional product development, training, and awareness-raising activities. By January 2018, Mayfair had covered about 1,059,214 farmers, which is the largest number insured in one season by any GIIF grantee.